We’ve covered everything from fuller looking ponytails to elegant hair buns, but what's a girl do when she’s can’t make up her mind whether to wear her hair up or down? It's easy! Go for half-up hairstyles! The hottest hairstyle trend today is not the classic up-do, or the favorite ponytail, but a combination of the two: half-up hairstyles! While the half-up is extremely popular right now, it's never really gone out of style. It's probably one of the most feminine ways to wear your hair. It's the perfect style for nights out, work, and even on your wedding day! The half-updo is a great hairstyle for a number of reasons! Not only is it incredibly effortless and easy to make, it’s the ultimate bad hair day style for second-day hair! It also helps keep your hair out of your face! Our newest hair accessory, Pony 2.O is perfect for any half-up style you want to wear. Your hair type doesn't matter when it comes to wearing half-up styles. Whether your hair is thick or fine, long or short, straight or curly, there's absolutely no reason to not wear it half-up. The Pony 2.O is slimmer than the original Pony-O. Designed specifically for fine hair, it's also PERFECT for half-up styles. Of course, for a fuller look, you can stick with the original Pony-O. Our innovative patented design helps you create hairstyles that will stay gorgeous all day long. No ponytail crease at the end of the day like you get from elastics, and no breakage or damage at all! Your hair looks thicker and fuller. Perfect for half the hair. Your hair isn't constricted inside, so no breakage! Awesome. Your hair isn't ripped out or twisted around the Pony-O. Taking it out is easy and pain free! Using your thumb and forefinger only, feed your hair through the Pony-O. Letting go of your ponytail, use both hands to hold the Pony-O close to your head. This helps to keep your ponytail secure. Use your thumbs and bend down each end of the Pony-O separately. DO NOT bend the Pony-O ONCE IN THE MIDDLE. It will not hold. 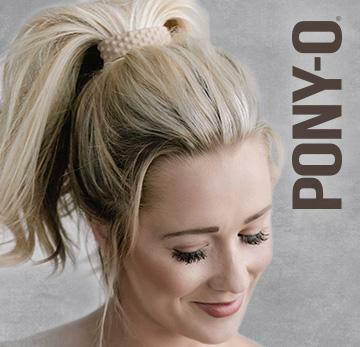 Check out these videos of some super cute and super easy hairstyles using Pony-O! And why not order yours here?